During a recent classroom observation I observed the use of a quick write strategy. While this is not new or something I have not used myself I reflected on its value. A quick write strategy is simple by design, but powerful in many ways. A teacher poses a high quality question to the class and asks students to jot down their thoughts regarding the question. After providing some time the teacher asks students to share their thoughts. All students in the class are provided the opportunity to reflect on the question and organize a response. Students who are slower processors are provided time to formulate a response before sharing with the class. Teachers may use this strategy as a formative assessment by circulating the room to view what students have written. Students may use this as a self-assessment by analyzing what they wrote in comparison to what other students in the class share. 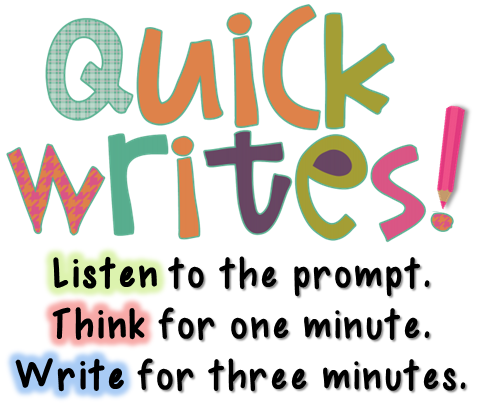 A quick write might be assigned as a "do now" in order for students to activate prior knowledge or as a closure activity to reflect on a lesson. The quick write instructional strategy provides an opportunity for everyone in the class to have a voice and reflect on the content. It levels the playing field and ensures active participation and engagement.